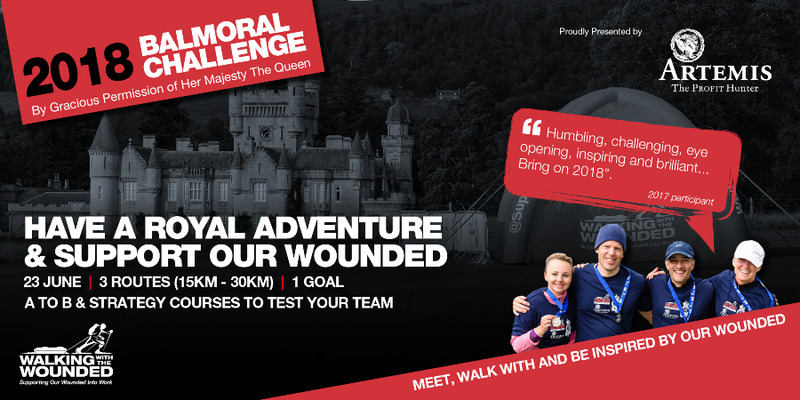 The Balmoral Challenge 2018, presented by Artemis, is a unique event for your team of four to meet, be inspired by and walk with our wounded beneficiaries from across Scotland over one of three beautifully challenging routes, starting and finishing in front of Her Majesty the Queen's Scottish residence. The event raises money for Walking With The Wounded to expand its programmes in Scotland and enable more vulnerable veterans with physical, mental or social injuries, such as homelessness, to access better mental health care and be supported back into employment. Every team that takes part supports an ex serviceman or woman to reintegrate back into society and regain their independence. Your team can make a real difference by getting involved. There is a route for all abilities and you’ll be amazed what you can achieve together on the day, and in advance with your fundraising. DATE: 22-23 June 2018 (registration from 5pm Fri, inc. dinner, briefing and talk). Prince’s Stone – The thinking one. Min 20km - Max 40km. How many points can your team collect within 9 hrs? Test your team’s strategy while exploring the wilder parts of the Balmoral Estate – will you gamble or make it back in good time after finding the historic Prince's Stone. The Cairn Chaser – The wee one. A 15km foray exploring the cairns in the forests above the castle. FUNDRAISING: Each team is challenged to work together and raise £2,000 to directly support a veteran back into independence. ACCOMMODATION: Unique opportunity to camp near the castle and explore the grounds. Book when registering your team or click here. The Balmoral Challenge raises funds to support vulnerable ex servicemen and women reintegrate back into society and regain their independence through WWTW's programmes. WWTW has employment advisors working out of Glasgow, Edinburgh and Dundee and a mental health programme accessible by any veteran via their GP. Each team at Balmoral is challenged to work together as part of your team-building preparation and fundraise £2,000. You will be amazed what you can achieve and you will be supported with a special fundraising pack containing ideas and tips of how to hit your target. You can also call Viveca or Andy on 01263 863 902 if you need further support or to talk through any ideas. We'd love to hear from you. Create a 'team' page and have an individual page for each team member linked into this. Your individual contacts prefer donating to you rather than a team page, while work colleagues etc might prefer to donate to a team page. Thank people publicly for their donations - it flushes out donations from others. Why are we doing this again? For veterans like Peter and Craig. This event is run by Walking With The Wounded staff and volunteers, the lifeblood of it's success and to ensure a personal and memorable experience for you, meeting people working on our programmes as well as meeting our beneficiaries. Want to be involved but can’t compete for whatever reason? Then please come and volunteer. Email viveca@wwtw.org.uk to find out more. Be part of something special and help us make this event sing. You will be made welcome and receive a unique piece of WWTW kit. "It was an absolute privilege to be part of the team over the weekend. (My partner) thoroughly enjoyed herself as well." "Fraser and I had a great time, we very much enjoyed meeting the beneficiaries and veterans and had a good laugh with the participants. We had a good look around Balmoral and managed a reasonable walk amongst the Cairns. We were very happy to help. We hope it was a great success and that next year will be even bigger."